Attend Public Meetings and provide input at Public Hearings*. Keep an eye on Basalt Town Council agendas for upcoming Our Town Planning discussions. Attend Planning and Zoning Commission meetings to follow the nuts and bolts of zoning implementation. Find P&Z agendas and packet materials by scrolling down to the bottom of the Planning Department page of the Town’s website. Follow along with the Parks, Open Space and Trails (POST) Committee as it works on park plans and upgrades. Stay tuned to the Basalt Affordable Community Housing Commission as it tackles this complicated issue. Read up on what communities across the nation are facing regarding downtown revitalization here. Send your thoughtful comments/suggestions to OurPlan@basalt.net. 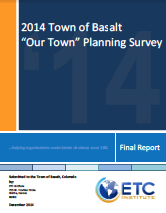 See what residents had to say in The 2014 Basalt Our Town Survey. *The public is always welcome to attend Town Council, POST, BACH and P&Z meetings. Public hearings are a legally mandated venue for airing your comments but please note that not all meetings are public hearings.